This creation isn’t mine — it is my aunt’s. She is 86 and very wise. When she was left with a tidbit of yarn, she tied it onto her last tidbit of yarn and so on, and so on. 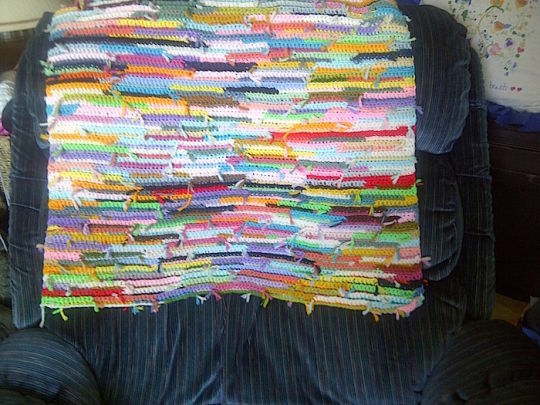 .. no trying to hide knots but, instead, utilizing them as a “tied afghan”. Brilliant. This could be a “crochet-as-you-go” item, crocheting each little bit as you get it, or tie the pieces together, creating an ever-growing ball of yarn to be utilized later. Love the idea. No more tossing away of those 18" pieces of scraps. I have a ball of yarn that I just keep tying my leftovers to….eventually i will have a giant ball of yarn and some really cute accessories. Nice idea… I hate throwing those bits away…lol… and I have a “few”. lol well, now, we’ll have “none” because they will all be part of a “Little Bits” creation. Debbie, I love it! Weaving in all the ends is a PITA, imo, anyway, and it gives the piece texture. Well done! MandaPanda, great idea! I have been keeping mine in a sawed off beer box (big enough to hold three skeins of SuperSaver snugly and small enough to stack). storing to use later is good but to crochet the pieces as you go is brilliant.